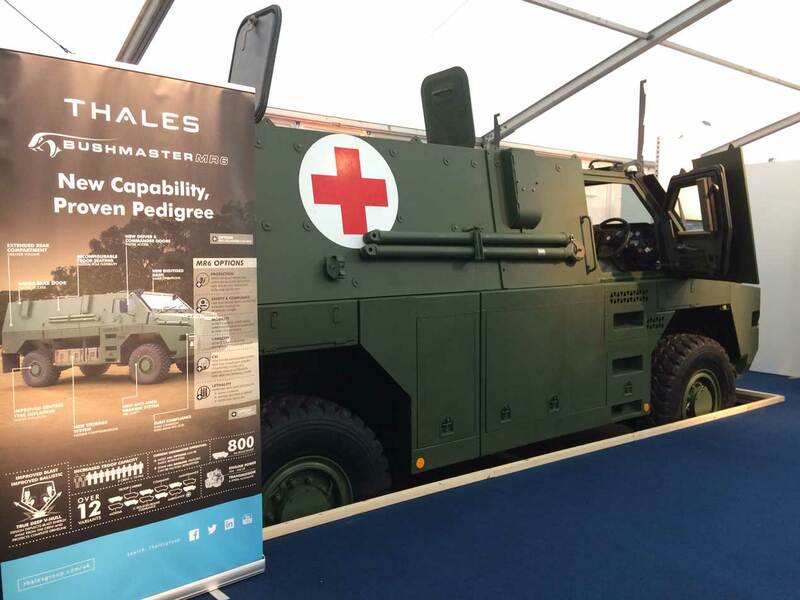 Thales Australia unveiled its new multi-role protected MR6 vehicle, which it is putting forward for the UK Multi-Role Vehicle Protected programme, at the International Armoured Vehicles (IAV) show in Twickenham London this week. Building on lessons learned from the original Bushmaster deployed in Iraq and Afghanistan and East Timor, the MR6 includes enhanced levels of blast, ballistic, RPG and fire protection and a “deep V” hull, which Thales says is designed to blast energy away from the crew and protect the complete driveline. A Thales spokesperson at IAV said the vehicle is designed to meet multi-role vehicle requirements for the next 15-to-20 years. The variant on display at IAV 2018 was the ambulance variant, but the MR6 can be used in more than a dozen different configurations, including as a command and control vehicle, counter-IED route clearance, troop carrier and maintenance vehicle. The MR6 features a flexible configuration for storage and improved central tyre inflation for enhanced tactical mobility. The UK Multi-Role Vehicle (Protected) (MRV-P) is designed to provide the British Army with a "family of adaptable, protected general purpose vehicles for command and logistics. It is broken down into two classes of vehicle: The MRV-P Group 1 for logistics, command and control, and liaison, which Oshkosh's Joint Light Tactical Vehicle is being considered for. MRV-P Group 2, which the Bushmaster MR6 is being put forward for — alongside General Dynamics' Eagle 6x6 vehicle and ,potentially, a Mercedes-Benz vehicle based on a Unimog chassis — includes Armoured Personnel Carriers (APCs) and protected ambulances. More than 1,150 of the original Bushmaster protected mobility vehicles have been delivered to Australian, UK, Dutch, Fijian, Japanese and Jamaican defence forces.